Recent posts on ideal players within the GURPS community got me thinking. What is my ideal player? As it happens, there's not much to it. I want my players so excited by the game that they have a hard time not turning up. While I can't say I provide this kind experience every time, I can say that players definitely won't have it if they don't turn up. To make matters worse, frequent missing players mean frequent missing contributions. I do my best to summarise previous sessions but some details are invariably missed out, so players who miss sessions often act out of character, breaking the narrative while the group readjusts to the unexpected behaviour. That said, absences do happen; this is my ideal player after all. My kind of player is the kind of player that is very interested in their character. I love GMing stories with characters that are rich, unpredictable and consistent. 'Unpredictable' and 'consistent' may sound like polar opposites. But all drama involves opposing forces. Does the hero save the girl or the children? What are the consequences if they do save the girl/children? What will others think of them for saving the girl/children? These competing ideals make the tension in my games. I really love to present situations where the players are surprised by their characters. That's the kind of investment you just can't magic up. Players that are invested in the game system, whatever the system is, are great. Investment is very different to mastery or knowledge. One can be invested in a system you have only heard about 5 minutes ago but mastery of a system only happens over time. Taking time to learn about how the system works to represent your ideas is essential. 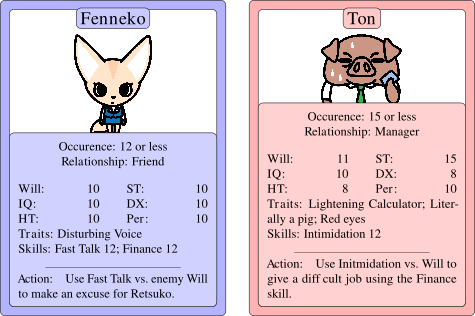 As GM, I have limited brain space for verbal descriptions but system mechanics are an agreed-upon standard for character data that will keep between games. Imagine a hacker that could always get physical access to the hardware. Because they are literally the shadows. Enter Pyramid #3/99, Necro-psi. NecroBurn is a hacker with a difference; he reads the minds of the recently deceased. 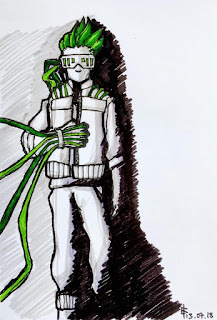 A garrote for hire, NecroBurn is an hacker-assassin who gains admin passwords from the sysadmin's brains. Since he needs physical contact to read the thoughts of said sysadmins, he always burns the body. Low Empathy Since a child, NecroBurn hasn't been able to understand emotions. 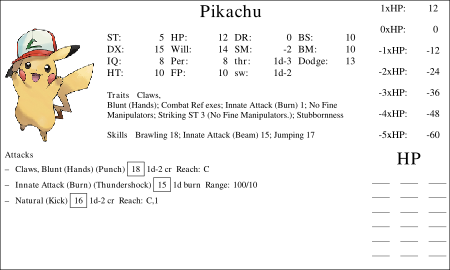 Amnesia (Partial); Wild Talent 1; Unknown disadvantages Reading dead minds all the time has a cost, NecroBurn has permanent lost a part of himself which is constantly replaced by his most recent read. He will sometimes quote memories from his read as his own, or even exhibit talents he has never trained in. Occaisonally, he sometimes acquires phobias, addictions or worse! Corpse Sense; Flashes of Insight The ability to read (dead) minds. See #3/99 for more info. Recently I've been wanting to read my Pyramid issues away from the computer. Attracted by various people's printing of GURPS pdfs, I thought I'd see if I could do it on the cheap. And I did! 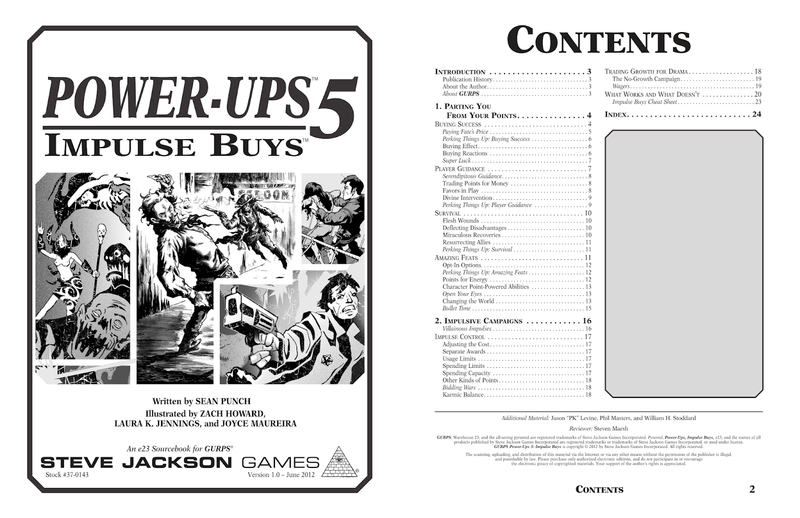 The binding/printing above cost around £7 (~$10) for ~170 pages of GURPS goodness. In this post I cover how I prepared my pdfs and how to change the code for page sizes other than A4/A5. 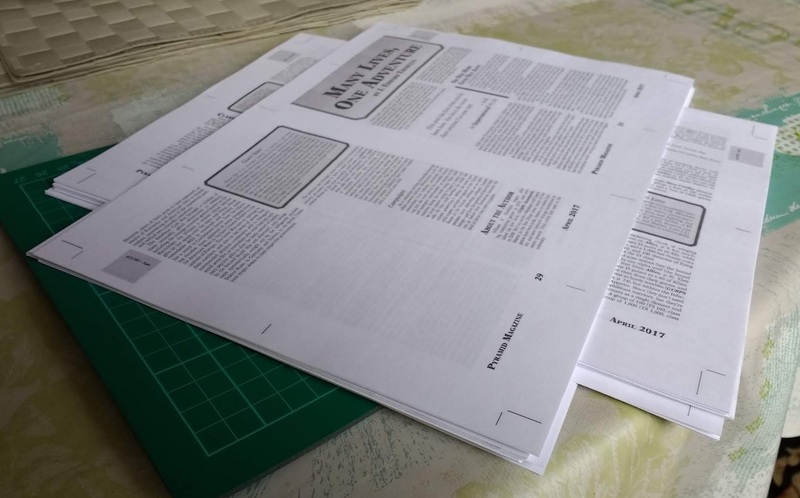 The premise is quite simple: Remove bitmaps from the pdf (to save on ink), remove full page ads (to save on ink) and add little printed tabs (so it's easy to see which issue I'm currently reading). Note: this method only supports some Pyramid pdfs as removing full page ad and cover pages requires manual intervention. More info in the source code. I chose Coptic stitching because 1) it's easy and 2) it doesn't require glue. There are plenty of bookbinding methods out there, so really it is up to you how you want to bind. I also chose transparency sheets for the covers since they are cheap and allow me to see the first and last page of the book. The last thing to mention is that you will need to trim the long edge to get the cool tab effect. If you don't have expensive equipment (like this vertical plough for £610 (~$800)) then you can use a sharp craft knife and a metal ruler. The result won't be perfect, but it in my experience it makes the book much easier to handle. ... Enter Impulse Buys. 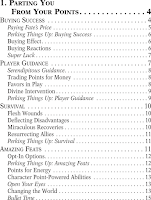 Essentially a budget for bending the rules, this book provides the GM (and players) with interesting ways to spend points to influence outcomes and the game world around them. On a personal note, I really enjoy the possibilities discussed in Impulse Buys, but it's not for every campaign. The premise is simple: spend points for good stuff to happen right now. Such a simple premise doesn't need a 20 page book explaining how to do it, but the insight and ideas on how to balance it make it good value for the $5.99 it costs. and much more. I wouldn't call any ideas here groundbreaking, but the real value is in the explanation of the consequences of each kind of rule-bending and how to cost it for balance. 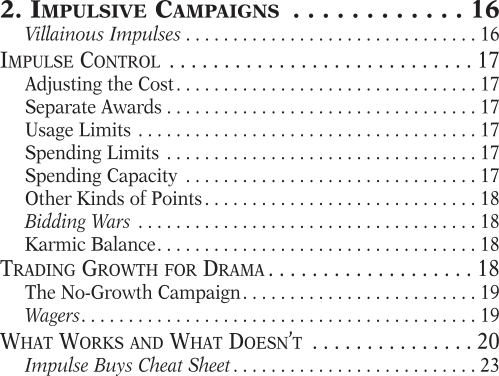 The second chapter 'Impulsive Campaigns' is about setting up impulse point buy in a campaign. It has suggestions for limiting power, making sure style of point buy fits the tone of the game and how to make spending points fun, not just as a way out of trouble. Just look at the contents for a flavour of the styles it provides. The book ends with an excellent summary page for quick reference. I don't find myself referring to these when live GMing at the gaming table (it's easy enough to remember), but it is great for players to browse and start to imagine the possibilities. 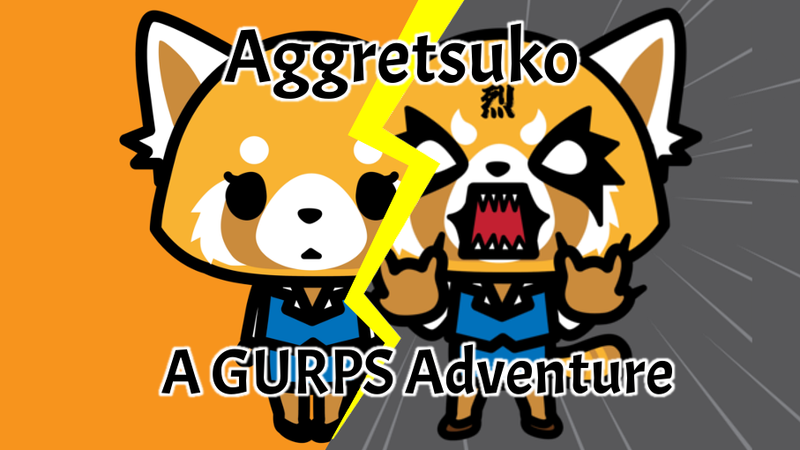 All in all, I think Impulse Buys makes an excellent addition to a GURPS GM's toolkit. 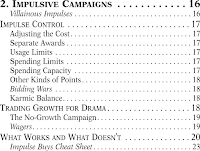 It won't be for every campaign but for those it fits, this book takes out a lot of the hard work of adding impulse buys. 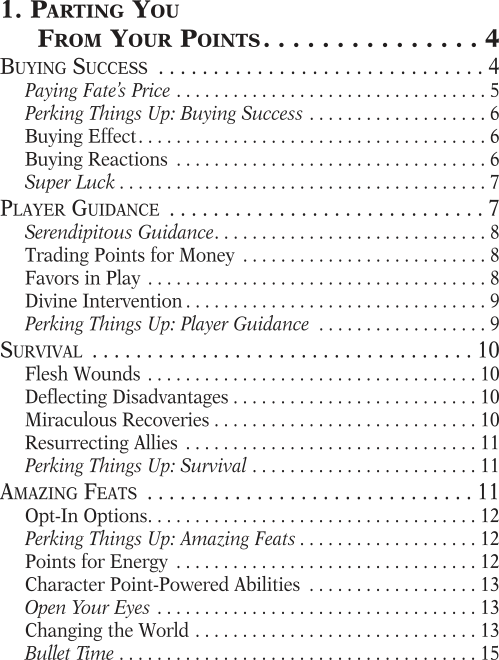 In essence, this book does for GMs exactly what it does for players: gives you what you need to just start playing! Warehouse23 product listing - if you want to buy it! Ash Ketchum from the town of Pallet! 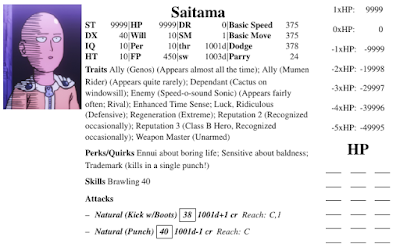 Pokémon was a large part of my childhood so it was good fun to design him in GURPS. 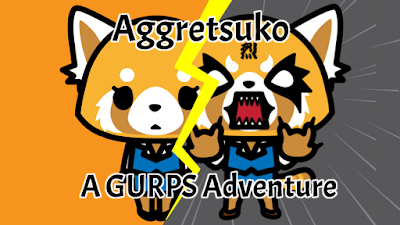 This is mostly based on the TV show, but it has a little bit of the game in it. Pokemon Trainer! 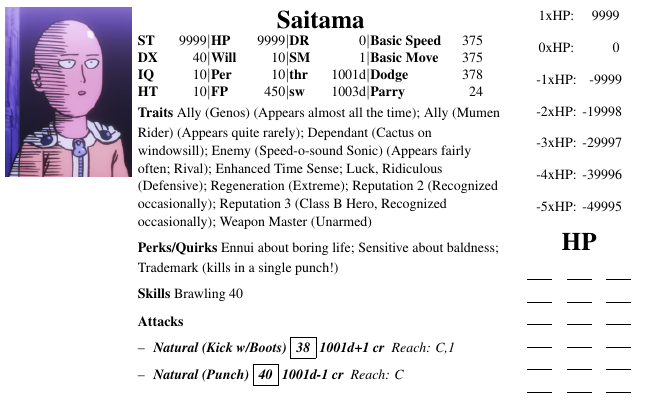 Use this skill in place of Animal Handling (All Pokémon), Expert Skill (Pokémon Trainer), rolls to persuade Pokémon and rolls to catch Pokémon. Pokémon trainers in the original games had 6 Pokémon which they could carry around at a time. 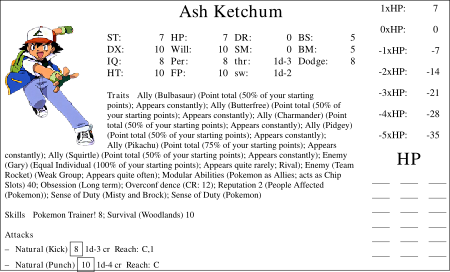 I’ve modelled this as Modular Abilities (Chip Slots) where each ‘slot’ is actually 8 points of Ally (at least it’s 8 points at Ash’s initial level). What do you think of this build? How would you have done things different?